Reese Witherspoon is well known for her great performance of acting June Carter Cash in the film Walk the Line. We also love her role as Elle Wood in Legally Blonde. We find that the actress often wears her hair in straight hairstyle. If you want to style your straight hair for a new look, you can check out the pictures here and get some inspiration. Reese Witherspoon wears her mid-length hairstyle in a wavy hair ‘do. She adds enough subtle waves and side parted bangs to the blonde locks which are highlighted. The brown highlighted tresses go well with her red lipstick. If you love the red lips, we think that you will like the soft hair. Reese Witherspoon opts for a shoulder length hair with side-swept bangs. The hair has straight hair that is falling freely from the top. It’s an easy and breezy hair ‘do for girls and it can silhouette the face well. Reese Witherspoon styles a retro curly hair for her mid-length hair. She sweeps all the locks to a side and creates a deep side parting that can reveal her beautiful face. The hair shines in its hue as well as with the make-up. Reese Witherspoon has a layered straight hair with side part for her mid-length hair. She looks pretty and chic in the hair that can go well with the slightly make-up and soften her edgy outfit. 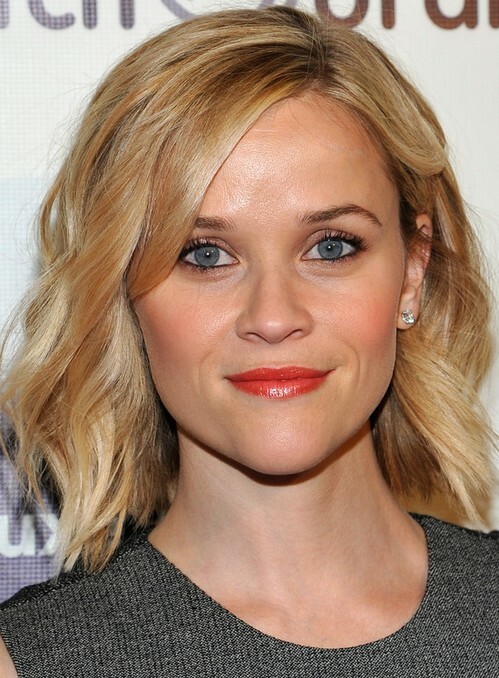 Reese Witherspoon chooses a layered curly hair with side parting for her medium length hair. She gives lots of curls to the bottom layer in order to bring a bouncy look. Reese Witherspoon styles voluminous curls to the blonde locks. She also pushes all the straight bangs back and creates a Mohawk-like hairstyle. If you want to try the hair, you can just curl lots of locks and tease up your bangs. It’s another Mohawk-like hair for Reese Witherspoon. This time Reese Witherspoon teases up her bangs when styling her blonde hair in the straight hair. She looks so bright and chic in the hairstyle. 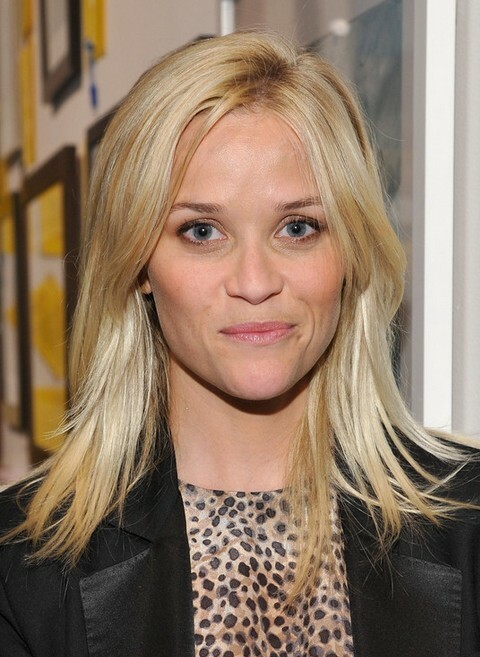 Reese Witherspoon looks like a next door girl wearing the straight blonde locks with side-swept bangs. The hair is the best for the thick hair to create a textured and soft hair ‘do. Reese Witherspoon styles a retro curly hair with featured side parted bangs for her sleek mid-length hair. She looks fresh and beautiful by tucking the curly hair behind the ears. 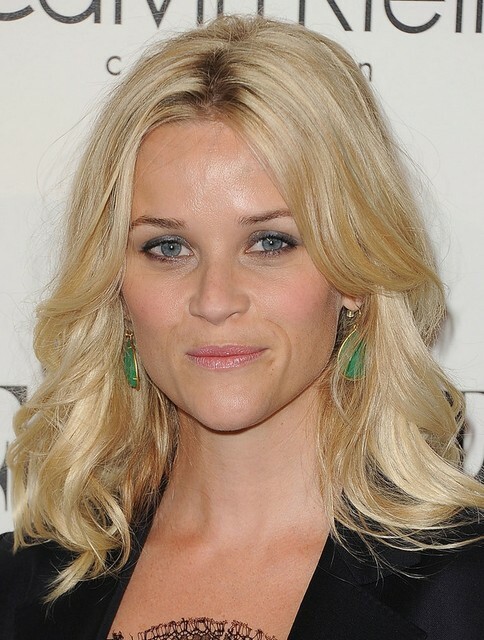 Reese Witherspoon’s mid-length hair with side part can bring a fluffy look. The hair is created by a layered hair ‘do and is added tousled subtle waves. If you want the same look, you can tease the hair a bit when drying the hair. Don’t forget to use the hairspray. Reese Witherspoon wears her platinum hair with side-swept bangs for the look. She adds the brown highlights smartly to the razored locks. The highlights enlighten her look brightly. Reese Witherspoon rocks her luxurious locks with center parting. The curled locks are cascading over the shoulders to frame her slightly make-up. Reese Witherspoon wears a super straight hair with side parting for her outfit. The hair is dip-dyed at the top and the ends so that it can add more colors to the whole look. Reese Witherspoon’s blonde locks are added the subtle waves again. The curly hair has swept-bangs and black roots that highlight her eyes. Though she wears a slightly make-up, she is shiny in the hair. Reese Witherspoon styles a straight hairstyle with wispy bangs that are lash-gazing for her long blonde hair. The hair can fit any face, so it can be worn in colors you want. Reese Witherspoon’s another long straight hairstyle is chic and fresh. The hair top is dip-dyed by brown hue to enlighten her face. 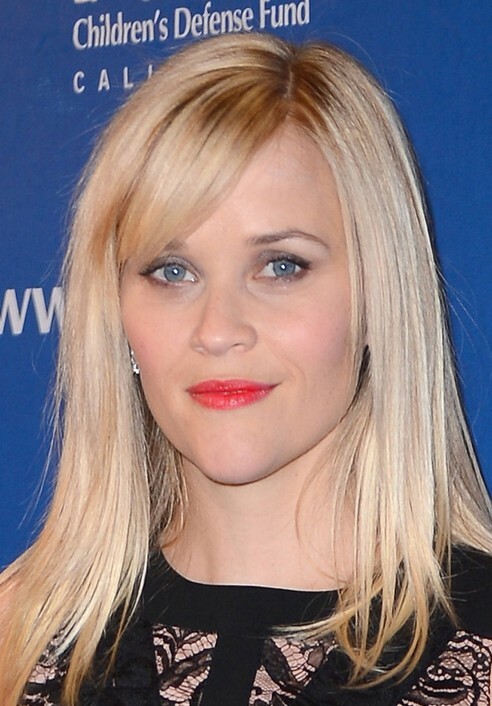 Reese Witherspoon sports her long blonde hair with a curly hair with straight bangs. She looks gorgeous in the cascading curls. Reese Witherspoon’s long copper hair is pinned up partially. The hair has side parting in order to reveal her adorable make-up. Reese Witherspoon pulls all the locks back and pins up some of her blonde tresses. It’s an easy hair and it brings an edgy look. Reese Witherspoon pins up her two-tone hair low and makes a stylish side parting. She looks elegant and chic in the hairstyle. Reese Witherspoon twists her blonde locks as a bun at the back. The side swept-bangs also complete the looks. It’s another back bun for the actress Reese Witherspoon. The bun is an angular hairstyle so it needs some hair productions to keep the shape when you style the hair. Reese Witherspoon pulls her sleek hair up and styles a full bun on top. She looks chic and retro in the hair ‘do.